A number of different options when it comes to the walls of a mobile home exist for the resident of one. Those that choose to install mobile home drywall are most likely looking at it from the ease of its installation and from an economic perspective. In the latter case, any maintenance or repair only requires the purchase of mobile home supplies to handle the job, instead of installing an entirely new wall. Before any installation of mobile home drywall begins, make sure that the power source has been turned off and remove the covers from all outlets. The length of the drywall sheets themselves will determine how far past the studs the electrical boxes should be moved forward. In addition, it will help determine how many key mobile home parts, such as joints, are needed. The walls may have baseboard or trim on them, which needs to be removed. Marking the cut line helps make the cutting process easier and can help avoid making errors that require starting again from scratch. The drywall will eventually be hung horizontally to the studs on the wall, using a drill and parts such as drywall screws. Using screws will avert disaster, since the risk of cracking the drywall though nails being pounded into it exists. Holes for the outlets can be cut out using a drill, which is then followed by the placement of the drywall on the studs. In order to allow for the proper drying to take place, it’s best to wait until the next day to address any of the follow-up issues. When that time arrives, sanding away some of the excess application of the mud. However, be aware that a little too much sanding can be disastrous since getting down to the tape in place can cause problems. That leads to waiting until the next day when sanding will change from the use of a medium to fine-grit sandpaper. One final application of mud then only requires using a moist cloth to wipe down the walls, with painting next on the agenda. Finally, the baseboards and trim should be nailed back on to the studs, while the outlet covers that had originally been removed prior to starting should be replaced. Basic Components has been around since 1986, supplying mobile home supplies that help make life in these unique structures enjoyable. 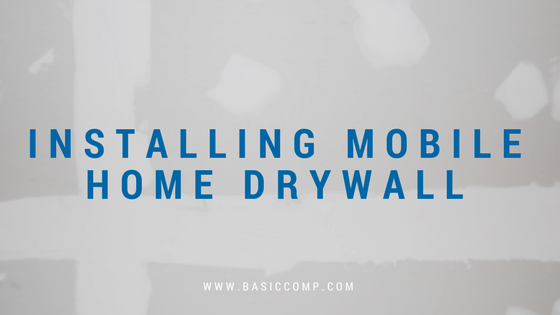 Besides items for mobile home drywall projects, Basic Components has mobile home parts for flooring and roofing concerns that deliver the sort of impact that will cause visitors to sit up and take notice. So when the time arrives that you’re in need of parts and supplies for your mobile home, contact the team at Basic Components.